The 'School as a catchment' project delivered on-ground integrated water management and urban greening features at Deer Park North Primary School and supported the production of an associated resource kit. The project was funded by the Victorian Government and delivered by Environmental Education Victoria, Josh Byrne & Associates, and 202020 Vision. The project also received great support from the metro water utilities. 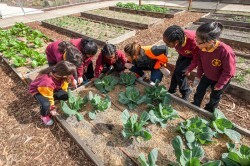 The pilot program at Deer Park North demonstrates how infrastructure improvements can provide water savings, increase biodiversity and provide hands-on learning opportunities for the school community. The new physical features include improved rainwater harvesting features, raingardens and a constructed wetland. The free online resource kit enables other schools to implement such projects across the country.